To reduce concentrations of chemical contaminants that can damage air quality, human health, productivity, and the environment. At least 75% of all paints and coatings, by volume or surface area, meet the VOC emissions evaluation AND 100% meet the VOC content evaluation. The paints and coatings product category includes all interior paints and coatings applied on site. At least 75% of all adhesives and sealants, by volume or surface area, meet the VOC emissions evaluation AND 100% meet the VOC content evaluation. The adhesives and sealants product category includes all interior adhesives and sealants applied on site. At least 90% of all flooring, by cost or surface area, meets the VOC emissions evaluation OR inherently nonemitting sources criteria, OR salvaged and reused materials criteria. The flooring product category includes all types of hard and soft surface flooring (carpet, ceramic, vinyl, rubber, engineered, solid wood, laminates), wall base, underlayments, and other floor coverings. 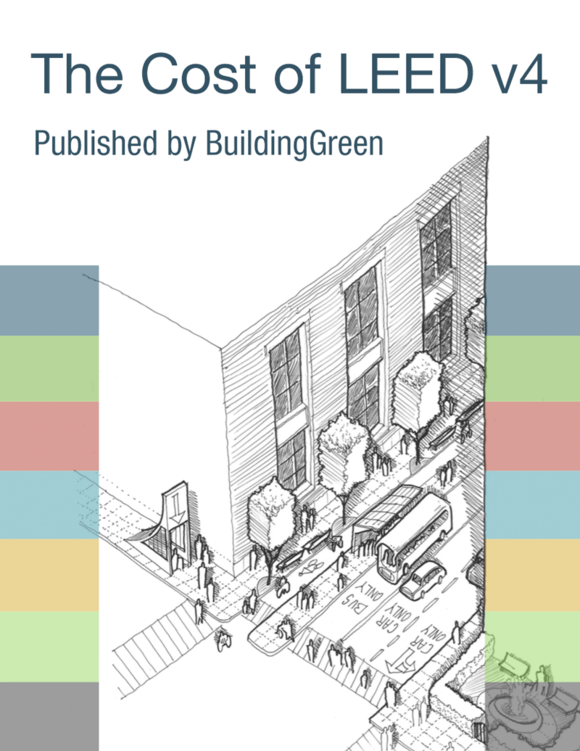 At least 75% of all wall panels, by cost or surface area, meet the VOC emissions evaluation, OR inherently nonemitting sources criteria, OR salvaged and reused materials criteria. The wall panels product category includes all finish wall treatments (wall coverings, wall paneling, wall tile), surface wall structures such as gypsum or plaster, cubicle/curtain/partition walls, trim, doors, frames, windows, and window treatments. Removable/interchangeable fabric panels, built-in cabinetry, and vertical structural elements are excluded. At least 90% of all ceilings, by cost or surface area, meet the VOC emissions evaluation, OR inherently nonemitting sources criteria, OR salvaged and reused materials criteria. The ceilings product category includes all ceiling panels, ceiling tile, surface ceiling structures such as gypsum or plaster, suspended systems (including canopies and clouds), and glazed skylights. Overhead structural elements (exposed, finished, and unfinished) are excluded. At least 75% of all insulation, meets the VOC emissions evaluation. The insulation material category includes all thermal and acoustic boards, batts, rolls, blankets, sound attention fire blankets, foamed-in place, loose-fill, blown, and sprayed insulation. Insulation for HVAC ducts and plumbing piping are excluded. At least 75% of all furniture in the project scope of work, by cost, meets the VOC emissions evaluation, OR inherently nonemitting sources criteria, OR salvaged and reused materials criteria. The furniture product category includes all stand-alone furniture items purchased for the project. At least 75% of all composite wood, by cost or surface area, meets the Formaldehyde emissions evaluation OR salvaged and reused materials criteria. The composite wood product category includes all particleboard, medium density fiberboard, hardwood veneer plywood, and structural composite wood not included in the flooring, ceiling, wall panels, or furniture material categories. Product is an inherently nonemitting source of VOCs (stone, ceramic, powder-coated metals, plated or anodized metal, glass, concrete, clay brick, and unfinished or untreated solid wood) and has no integral organic-based surface coatings, binders, or sealants. Product is more than one year old at the time of use. If finishes are applied to the product on-site, the finishes must meet the VOC emissions evaluation AND VOC content evaluation requirements. The statement of product compliance must include the exposure scenario(s) used, the amount of wet-applied product applied in mass per surface area (if applicable), the range of total VOCs, and follow guidelines in CDPH Standard Method v1.2-2017, Section 8. Organizations that certify manufacturers’ claims must be accredited under ISO Guide 17065. Option 2. Product has been tested according to EN 16516:2017 and complies with the LCI values from Table 1 of the German AgBB Testing and Evaluation Scheme (2015) and a formaldehyde limit of 10 micrograms per cubic meter. Additionally, the range of total VOCs after 28 days was measured as specified in EN 16516 and reported (TVOC ranges: 0.5 mg/m3 or less, between 0.5 and 5 mg/m3, or 5 mg/m3 or more). Laboratories that conduct the tests must be accredited under ISO/IEC 17025 for the test methods they use. The statement of product compliance must include the amount of wet-applied product applied in mass per surface area (if applicable) and the range of total VOCs. Organizations that certify manufacturers’ claims must be accredited under ISO Guide 17065. Product meets the VOC content limits outlined in one of the applicable standards and for projects in North America, methylene chloride and perchloroethylene may not be intentionally added. Statement of product compliance must be made by the manufacturer. Any testing must follow the test method specified in the applicable regulation. If the applicable regulation requires subtraction of exempt compounds, any content of intentionally added exempt compounds larger than 1% weight by mass (total exempt compounds) must be disclosed. EPA TSCA Title VI or CARB ATCM formaldehyde requirements for no added formaldehyde resins (NAF). Product has been tested in accordance with ANSI/BIFMA Standard Method M7.1–2011 (R2016) and complies with ANSI/BIFMA e3-2014e Furniture Sustainability Standard, Sections 7.6.1 (for half credit, by cost) OR 7.6.2 (for full credit, by cost). If 75% of the furniture also complies with Section 7.6.3 in addition to 7.6.2, the category counts for exemplary level (90%). Laboratories that conduct the tests must be accredited under ISO/IEC 17025 for the test methods they use. Seating products must be evaluated using the seating scenario. Classroom furniture must be evaluated using the standard school classroom scenario. Other products should be evaluated using the open plan or private office scenario, as appropriate. The open plan scenario is more stringent. Statements of product compliance must include the exposure scenario(s). Organizations that certify manufacturers’ claims must be accredited under ISO Guide 17065.